I’ve finally realized that it’s not what I knew that has been important, … it’s been my way-of-Seeing. A capacity that helped me “know” (or believe I did) by providing a way for me to see through organizational complexity to its simple root causes. “My problem” is not that I could do that…but that I believed what I saw. 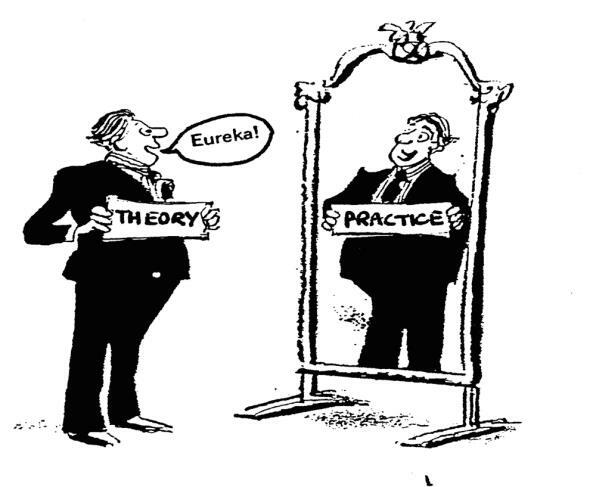 Metaphorically, the continual “Eureka”-generator for me actually was the cartoon’s “mirror.” A tool that created a sense-making “frame” around my way-of-seeing, …and then thinking, …and whose “glass” offered a different reflective surface. This soon became both a “lens” to frame my understanding of the present and future, and also a “mirror” whose different shape and nature influenced my “reflective learning” by portraying the past in ways that made sense of why things worked or didn’t. On the one hand, the nature of that “mirror” has enabled me to bridge the Theory-Practice gap in my own thinking because I had found way to “see” and address those connections in practice. Based on a “Theory” (interestingly from Biology, not Social Psychology) it could make connections visible and generate, “light-bulb moment” epiphanies that could break through the mind’s “see-what-we-believe/believe-what-we-see cycle that generates and limits sense-making. This condition had direct consequences for the rest of his life. For me, it’s become an on-going, frustrating struggle I once expressed in a blog: Copernicus’ Curse and Galileo’s Pain. “… as this became my natural way-of-seeing and understanding, it enabled me to ask “different questions,” and also to see, first why some schools “different answers” were working; and then, how many of those answers were interdependent and connected. Possibly forgotten by many who only know Alice from her “Adventures in Wonderland” is that her learning adventures didn’t end there. 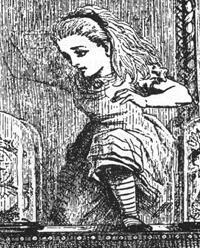 Lewis Carroll in 1871 wrote a sequel — Through the Looking-Glass, and What Alice Found There. Alice’s thoughts that will be reflected in this series of occasional blogs come not just from the different theory ground into that lens, but from experience continually viewing through it actual practice in a major school system –the Montgomery County MD Public Schools. That story is told elsewhere on this site. …get-out-of-the-box to find a different Big Picture…through the Sabusense.com website. Today however, my frustration has a new urgency and intensity as the complaint in education that “The system is broken!” now is directed at the larger social and political systems of which it is part. Fixes in all sectors are required for present practices and through this “lens” one cannot just “see” better ways for fixing them, but already effective practices in some sectors that people don’t think are relevant in others. A concept that Systems Thinking’s guru, Peter Senge, once cited as the essential missing element limiting today’s practitioners — The lack of a perspective of an organization as an “indivisible… wholes-within-wholes …whole.” He called this new way-of-seeing a 6th Discipline and cautioned that it would require “direct experience” to translate the theory into practice. But today it’s no longer a “theory” and can be found embedded in the mindsets of some World Class CEO’s and other system leaders whose direct experiences enabled them to break through their “See-what-we-believe/Believe-what-we-see” vicious cycle to accept the indivisible scope and nature of their organizations as “givens.” The starting point for their effective strategies and practices. Galileo would have had to wait 300 years for others to “see,” and accept as fact, what he couldn’t “unsee.” That learning curve is no longer an option. Posted: December 30th, 2016 under Meaningful Metaphors.